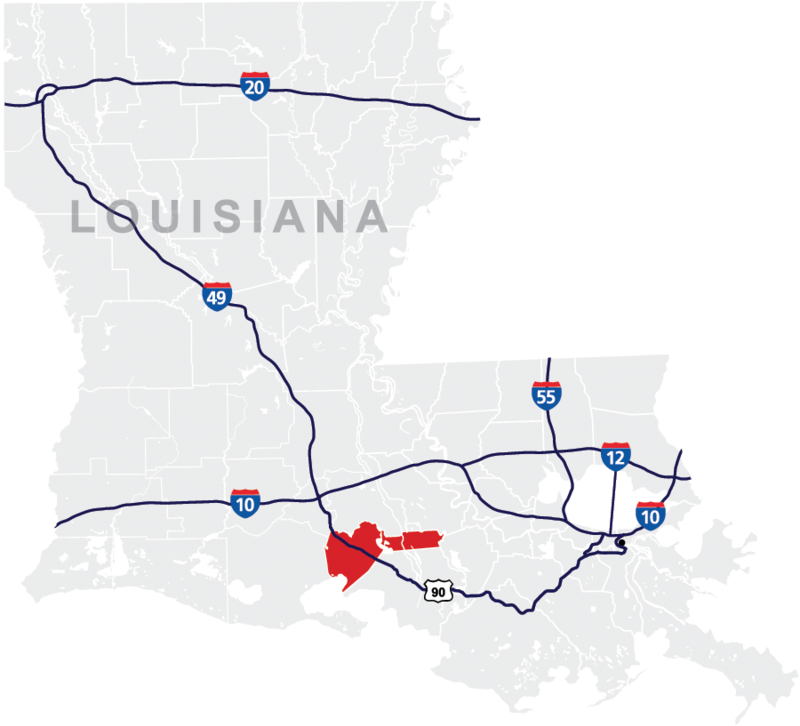 Centrally located between Houston and New Orleans on US Highway 90, the future corridor of Interstate 49. 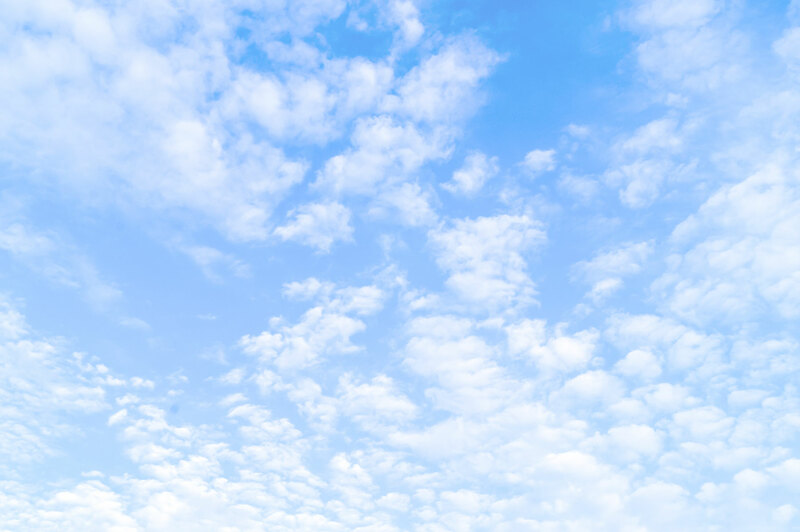 The 8,002 foot, military grade, concrete runway is located on a 2,000 acre all-weather, completely certificated and instrumented, General Aviation airport complex. It is equipped with a fully staffed Air Traffic Control Tower and support services. The passenger terminal offers Executive, VIP, Air Charter and Air Taxi services. With expedited screening and no crowded terminals or FBO lounges, it’s a quick walk from a vehicle and to the aircraft. Acadiana Regional Airport is home to the Louisiana Technical College's Teche Area Campus, the University of Louisiana's Research Center, as well as nationally known companies like Avex, Aggreko and Bristow, the premier helicopter services provider. With 1,200 acres remaining for development, including prime runway and taxiway frontage, there's plenty of room for your business to take off. The 125-acre Industrial Park, features true intermodal transportation opportunities, including the airport's 8,000-foot lighted runway, 5,000-foot lighted seaway, an on-site Louisiana Delta rail spur, easy access to Highway 90 and a location just minutes away from the Port of Iberia and the deep waters of the Gulf of Mexico. Acadiana Regional Airport is a public use airport owned by Iberia Parish Government and managed by the Iberia Parish Airport Authority. From 1960 – 1965 it was operated by the U.S. Navy as a Naval Auxiliary Air Station for an advanced flight training base. It was closed in 1965 and control of the airfield was reverted to the local civilian government. Acadiana Regional Airport serves as a helicopter flight training location for several companies and is also used on a regular basis by NASA, the U.S. Air Force, and U. S. Navy as a cross country flight training destination. 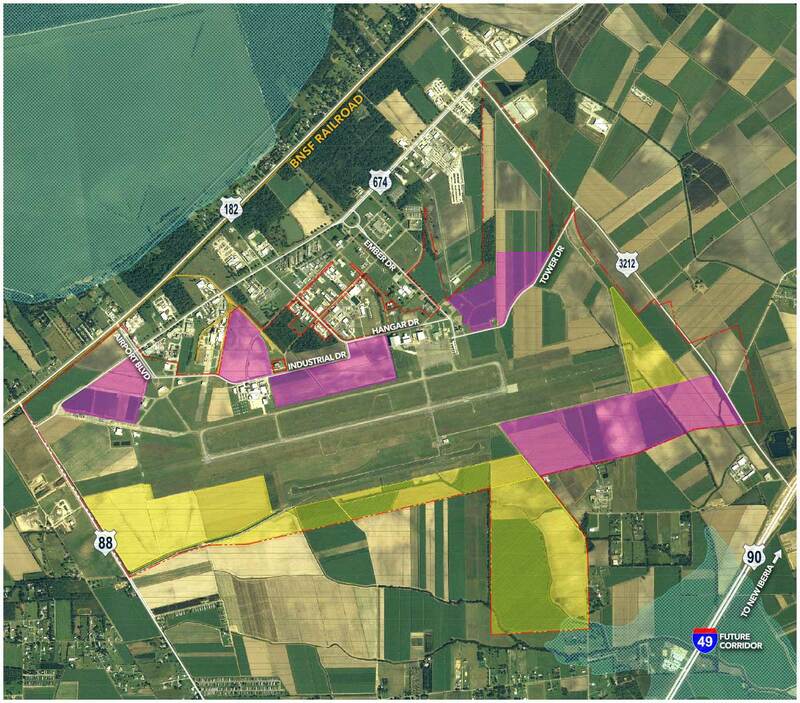 Acadiana Regional Airport has approximately 1,200 acres of property for development including prime runway and taxiway footage. Click here for more information.